The new 32-bit CPU provides functions normally present only on coin change machines of higher range and price, such as importing/exporting configuration parameters, exporting accounting data and the useful function of machine cloning. The reinforced closing mechanisms and the new anti-theft and split-hypenated protection devices make the Easy Change PRO one of the most secure change machines on the market with respect to attempts of tampering and fraud. 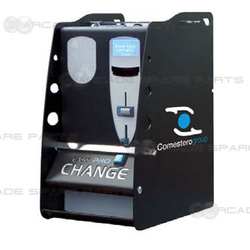 Fitting perfectly in everyday environments, such as shopping centres, gyms, airports, stations, arcades, offices, bars and Internet cafés, the Change Machine Easy Change PRO maintains its reduced size yet boasts an exceptional coin capacity thanks to the extension applied to its dispenser.